HIGHLANDS– In a letter to Environmental Protection Agency (EPA) Administrator Lisa Jackson sent Aug. 10, Rep. Gene Green (TX-29) requested the immediate attention of the EPA through the installation of additional fencing and warning signs around the San Jacinto Waste Pits Site. Several constituents expressed concerns with inadequate notice to local fisherman of the toxic water. While fishing in local waters is widespread, people may not realize how toxic the San Jacinto Waste Pits Site is and the danger they are putting themselves in by eating what they catch from this water, said Green. The 20-acre site is on the western bank of the San Jacinto River. Originally constructed as a disposal for pulp and paper mills, the water has high levels of dioxin concentrations. Because of tidal forces, the dioxin concentrations have moved beyond the current placement of security fences and signs. 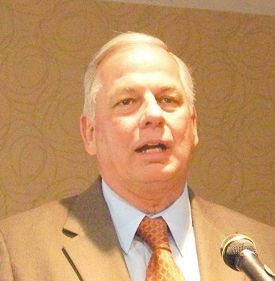 Green urged Administrator Jackson to mitigate a potential public health problem by additional protective measures to avoid fishing in this hazardous water. Regional Administrator Al Armendariz of EPA Region 6 responded with preliminary approval to International Paper Company and McGinnes Industrial Maintenance Corporation for additional fencing and warning signs at the site. The Regional Administrator also gave a commitment to continue working with the community and responsible parties to address these concerns moving forward. We will continue to work with the EPA to inform the public about the dangers of fishing in this water and prevent the consumption of contaminated fish, continued Green. CROSBY  The fall semester for Crosby ISD is bringing a variety of renovations to both facilities and district grounds. Construction projects will impact all six campuses, the Instructional Annex, the Administration Building, as well as the Crosby High School baseball field and softball field. Thanks to tax payer support and the diligence of the Crosby ISD Board of Trustees, this extended improvement project is set to begin in the upcoming weeks. One of the most significant upgrades to the district facilities is also one which is least visible. Electrical and technology infrastructure is being installed at all six campuses, the Annex and the Administration building. This infrastructure is the primary step necessary to integrate technology into classroom instruction. Additional campus renovations for Barrett Primary include the replacement of fire alarm and PA systems, new parking lot lighting, reconfigured & expanded drive for cars, modified bus drive, additional sidewalks and canopy extension. Improvements posted for Newport Elementary entail new fire alarm and PA systems, new lighting, parking upgrades, a modified drive for the Special Service bus and expanded faculty and staff parking. Drew Intermediate renovations target fifth grade restrooms, replacement of exterior doors in the Fifth Grade wing, expanded parking, and new sidewalks around the PE and play areas. Slated for renovation at Crosby Middle School are the PE and athletic restrooms and the replacement of roof systems and skylights. Crosby High School improvements include the conversion of two computer labs into two science labs and the renovation of restrooms. Significant upgrades occur at both the girls softball and boys baseball fields. New construction will include handicap accessible parking and seating, sidewalks from the new parking area to the new seating areas and modified and relocated bleacher seating. Each field will also receive a new press box, new sound system and relocated scoreboard controls and a new pole and netting system. The chain link fencing at the 1st and 3rd baselines will be replaced with six foot fencing and fencing will be installed at the field side of the dugouts of the baseball field. In order to relieve campuses that are approaching enrollment capacity, the Instructional Annex will be renovated to accommodate students as soon as the 2011  2012 school year. In addition to the new technology and electrical infrastructure, the Administration Building will receive a new roof, replacement HVAC units, new visitor and staff parking, new site lighting, accessible sidewalks and a new canopy. Projects already completed or currently underway include at Crosby Middle School – the installation of a new gym floor and bleachers, drainage improvements at the drop-off location, and the installation of 2 portable classrooms. Also in process is the installation of modern security camera systems at all CISD campuses. In consideration of all the improvements, upgrades and accessibility work, the district appreciates the work of all involved, and more importantly, is thankful to the Crosby community who made these efforts possible. HIGHLANDS Harris County Precinct Two Commissioner Sylvia R. Garcia was presented with the Guardian of the Bay Award from the Galveston Bay Foundation for her work to bring the EPA to the San Jacinto River Waste Pits for remediation. 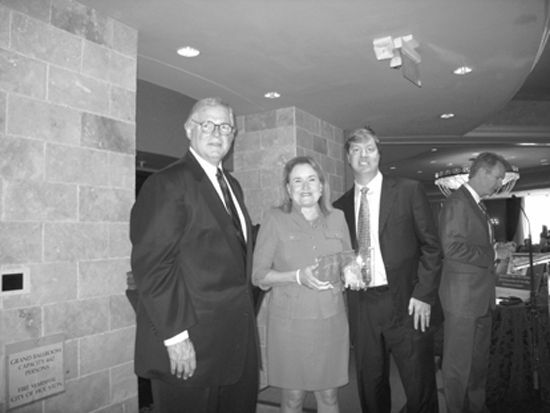 Presented at a luncheon on Wednesday at Houstons Hotel Zaza, the award cited Commissioner Garcias tireless efforts in getting the site recognized by the Environmental Protection Agency as a Super Fund site. The Foundation also recognized Commissioner Garcias continuing efforts to work with the EPA as they begin their actual work in containing and cleaning the location that releases dangerous dioxins from the site of a former paper mill. CROSBY  A mass of people from throughout the United States came to visit with a local man that served his country in daring ways for most of his life. 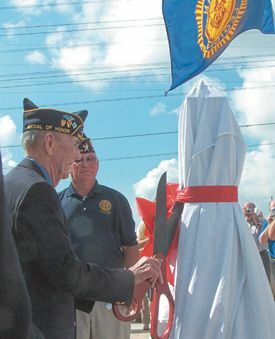 David McNerney, Clarence Sasser and Mike Thornton all Congressional Medal of Honor Recipients attended a special monument dedication at American Legion Post 658 here last Saturday, they were joined by many of the men that served that auspicious day in 1967 with McNerney. Vice-Commander Don Guillory opened ceremonies with a welcome. Rev. Richard Amador pronounced the invocation. Flag colors were posted by Crosby H.S. JROTC, which is most appropriate since a new $3 M. JROTC building will be named after McNerney once completed. Colonel Rick Sauer, a Silver Star recipient from his service on that fateful day in Polei Doc, led the Pledge of Allegiance. Gerald Blankenship, Crosby ISD trustee was key organizer of the dedication and the petition to name the JROTC Building for McNerney. American Legion Officers and visitors were introduced by Vice-Commander Don Guillory and Gerald Blankenship introduced elected officials, and candidates for Texas District 127. Gene Warden, Commander of the Texas American Legion gave a Medal of Honor Certificate and Gary Alexander gave e Medal of Honor Host City. Following, the crowd sang God Bless America lead by a recording of Kate Smith. Then all congregated for refreshments. McNerney got his first of five Bronze Star in Korea in the U.S. Navy. He joined the Army in 1956. He served as advisor to the Army of Republic of Vietnam Nationals 1962 through 1969. In 1970 he became a U.S. Customs Inspector. 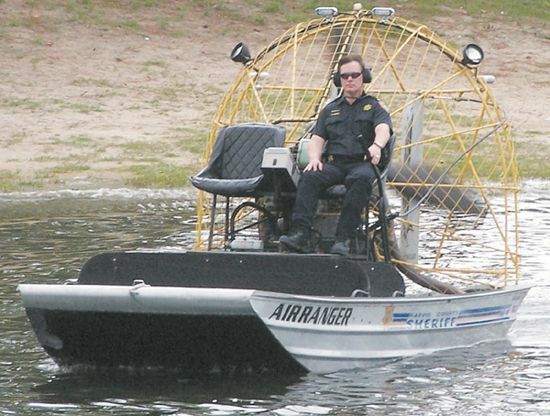 In 1985 he made history by interdicting 4 tons of marijuana inside the Port of Houston. Houstons largest bust. His unit was attacked by a battalion of Viet Cong and North Vietnamese regulars March 22, 1967. His daring under a fusillade of enemy fire, being wounded by an explosion, taking command of the unit, directing fire, preparing an evacuation landing, communicating artillery coordinates successfully won the two day battle. I was a professional soldier. But, I really never though I was going to be seriously hurt by amateurs. the finest man Ive met told this reporter. 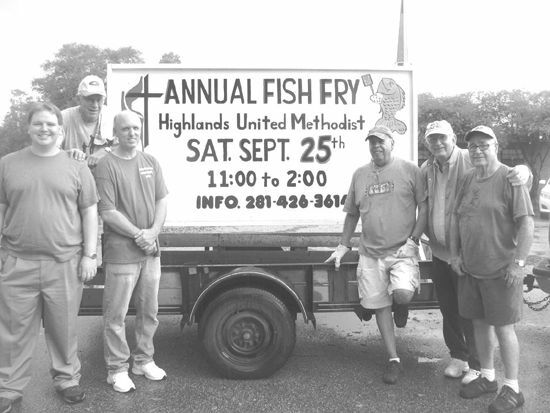 HIGHLANDS Highlands United Methodist Church is in the midst of plans for their 20th Annual Fish Fry and Auction. Tickets are being sold by church members. Ticket chair is Julie Gilbert. Adult tickets are $9 and children are $4. For advance tickets you may call the church office at 281-426-3614. Tickets will also be sold at the door. 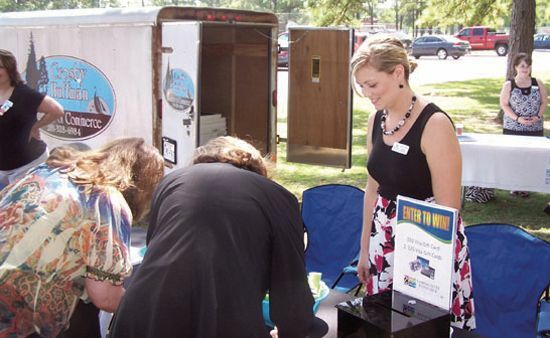 The event will be Sept. 25 with service from 11 a.m. to 2 p.m. The fried catfish dinner includes fries, hush puppies, cole slaw, dirty rice, and iced tea. The cooking team is headed by Jody Andrus and the kitchen crew is directed by Tracy Andrus. Delicious desserts are available at the Sweet Shoppe. Dinners for groups of 10 or more will be delivered. If your business is interested, call 281-426-3614. All proceeds from the Fish Fry will go to the ministries of the church. These include a 10% donation to the Highlands Food Pantry, support for the United Methodist Committee on Relief (UMCOR), youth program, camp scholarships, New Church/Revitalization fund, and many others. HUFFMAN– The Hargrave Falcons racked up nearly 600 yards of offense in their 45-12 win over the Kashmere Rams Friday night. The win gives Hargrave a 2-0 start on the season. Just over two minutes into the game the Falcons fans jumped to their feet when Cole Berry completed a pass to Riley Julian. Julian then streaked 76 yards for a touchdown. Cade Hardy ran in the two-point conversion for an 8-0 lead. DeBerry completed 13 of 22 passes for 258 yards. Julian had four catches on the night for 95 yards. Five minutes later DeBerry found Casey Martin who scored on a 77-yard pass. Cannon Cotters kick made it a 15-0 game. The Falcons continued to pound the Rams in the second quarter. 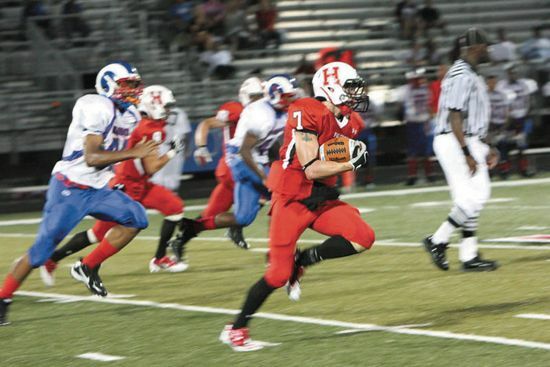 Taking the handoff at his own 41 yardline, Matias McCloskey drive the length of the field for a 59 yard touchdown run. A missed extra point left the score at 21-0. While the Falcons offense was moving the ball, the defense used turnovers to keep the Rams at bay. Hargrave recovered two fumbles and caught two interceptions. The biggest interception of the night came shortly after the McCloskey touchdown. On the Rams next possession Anchor Ebaks intercepted an Anthony Wiltz pass and returned it 31 yards for a touchdown. Martin closed out the scoring in the first half with a 59 yard run to give his team a 35-6 halftime lead. In the third quarter Cotter came through again with a 17-yard field goal and a 38-6 lead. 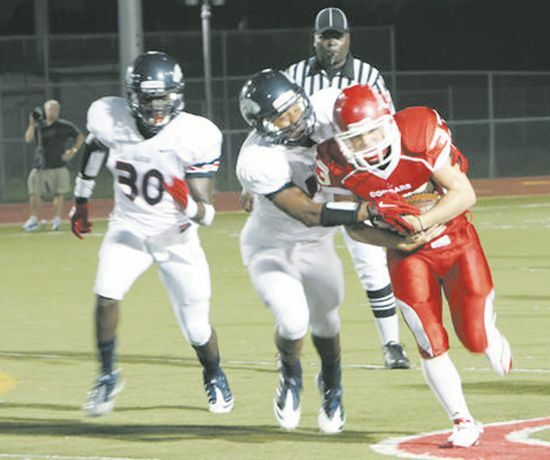 Hargrave would score once more when Joel Witwer pulled in a 21-yard pass from DeBerry in the third quarter. 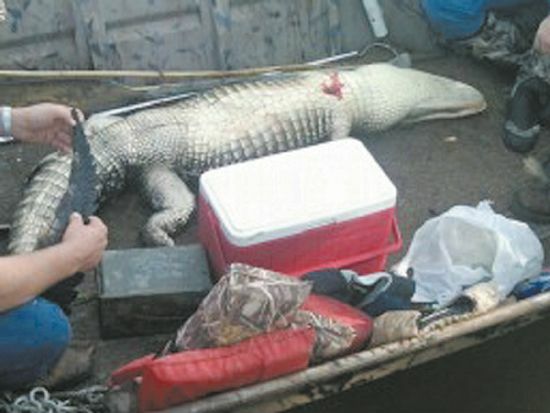 NORTHEAST HARRIS COUNTY  Seven drownings on Lake Houston and the San Jacinto River this summer, while certainly not a record, are prompting authorities to attract public notice of some dangerous realities related to fishing, boating and mostly swimming. Authorities say only two of those drownings were related to alcohol and all but one were in the San Jacinto. In 2009 and 2007, 3 drowned, 1 intoxicated; all were adults. In 2008 four drowned, two children and 2 male adults; only one was intoxicated. In 2006 11 drowned. Anticipating thousands of people visiting the areas on Labor Day Weekend, the Harris County Sheriffs Office held a press conference on Sept. 3 at Loves Marina concerning not underestimating the powers and dangers of the open water, especially factoring in the heat, fatigue and the need for safety, said Media Spokesperson Christina Garza. According to Captain Denise OLeary a lot of the drownings have to do with the lack of swimming ability, and with many in attendance it is easy to get distracted. One grandmother drowned this year. About 70% are adults. The drowning process occurs between 20 and 60 seconds. He encouraged parents to teach their children to swim at an early age. None of this years water tragedies were boating related. About 20% were alcohol related. Leaping from the bridge one can strike the water with their side and get the wind knocked from their bodies. There is a rope under the Crosby Freeway that swings out into boating lane where vision is obstructed, it is not recommended to swing there. The Marine Division started back in 1956 in the days of Buster Kern. There are about 50 people using Sheriffs equipment on volunteer time. There are three black water certified divers in the division.